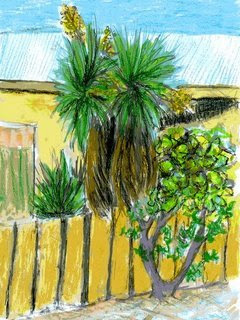 I have lived in many houses over the years and thought I would try and remember the view from the dfoorway or window. 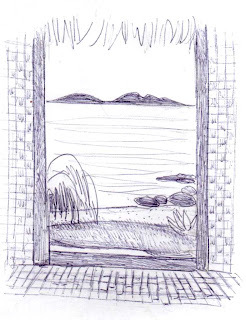 There are two - a bamboo walled Fijian bure near the sea and every morning we would look out to see Vorovoro and Mali Islands. Another is from a house in Toorak, Suva where I rented a room one year. It overlooked Jubilee Hall and a mosque was opposite. The other pictures are a view from this room - where the computer is - and looking through the lounge room doorway before the trees were cut down. 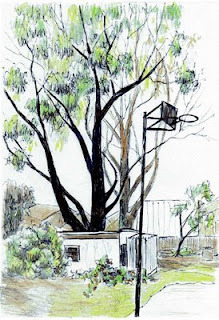 The coloured pictures were made some time ago and the Biro sketches this morning as I wait for some sunshine to go shopping to Watson Rd shopping strip. 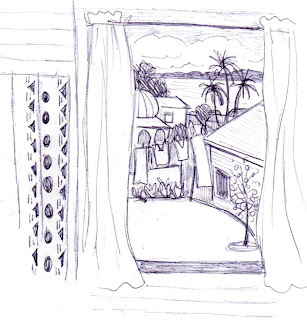 I like your room with a view idea, I have always taken photos out of our bedroom windows when we go away to different places. Will be in Melbourne tomorrow and going to Paperific at the Showgrounds on Friday, a Welsh pony meeting near the airport on Saturday and then home after it. With my mother being sick I cant be away for long. How do you like Melbourne's weather? Actually today was sunny for a while. I did some more rooms with a view and hope to do a couple with paint or pastel later.